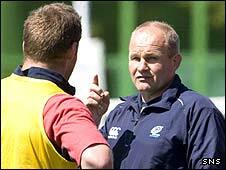 Coach Andy Robinson called for more of the same when Scotland A play their second match of the IRB Nations Cup. The Scots impressed in their 49-7 win over Russia on Friday in Romania. Robinson said: "An important part of playing for your country is you've got to be passionate and be hungry and I think every player showed that. "We've got Uruguay on Tuesday and we'll look for a similar attitude. Credit to everybody in the way that they have approached the whole week." The victory against Russia was Robinson's first as head coach of both Scotland A and the full side, having agreed to lead the side in the tournament while coach at Edinburgh. And the Englishman was delighted at the start made by the side. He said: "Right from the first whistle we got a driving maul going and we were able to break out of that and finish off with a try from Rob Dewey's first touch. "Chris Cusiter looked really sharp in the way that he controlled things. "For Jim Thompson's first try, Chris made the break and there wasn't a lot of support around him. "Looking the other way, he put the kick cross-field for Jim to score and that was outstanding. "We saw how he has developed over the past couple of years playing in France." Describing his position as coach of the full squad as giving the Scotland A squad "a bit of extra focus", Robinson paid tribute to his defence in the convincing win over the Russians. "Russia attacked with real width and kept hold of the ball for a number of stages and it tested our defence. "I was pleased with the shape we had in our defence and the go-forward around the breakdown was really pleasing. "The Russians kept playing for the whole 80 minutes, so credit to them. "There are lots of areas for development, to keep improving, but it keeps everybody's feet on the ground. What we saw in parts was a bit of a lack of understanding of the contact area, but also the technical aspects." The performance gives Scotland fans an indication of what they can expect under the new manager's regime. "I'd like to think that the way we play is challenging. "We try to be unpredictable and whatever we decide to do the players must understand the technical and tactical aspects. "I'd like to think we'll be winning games, that we'll understand how to win the game. We'll keep fighting for everything, keep scrapping. "We've got to make sure that we don't concede points. The game's about points accumulation. We want to keep the scoreboard constantly ticking over and take every opportunity that we get." Looking ahead to the Scots' second match, against Uruguay, Robinson is banking on his team's strength and fitness. "We watched them play Romania and they struggled with the physicality of the Romanians," said the 45-year-old coach. "They haven't had as strong a scrum as they've had in previous years, it's not as big a side as previous years either, so they'll have to move the ball pretty quickly. "They'll play with a lot of pride and passion. "However, they played on Friday, like us, and I'd like to think that, with our greater fitness levels, we should recover quicker and be able to impose ourselves."